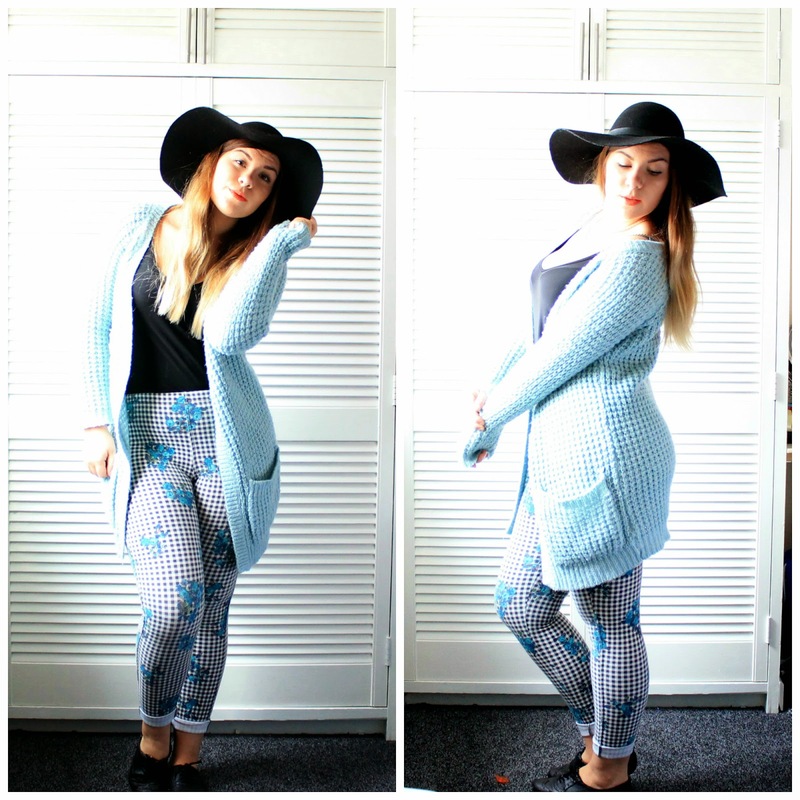 Today's post entails statement leggings & my current obsession with a hat. The other day I was running a bit late (as per usual) & Hadn't even thought about what I was wearing, thus this outfit was pretty spontaneous & I'm more than happy with the outcome. Let's begin with the leggings. 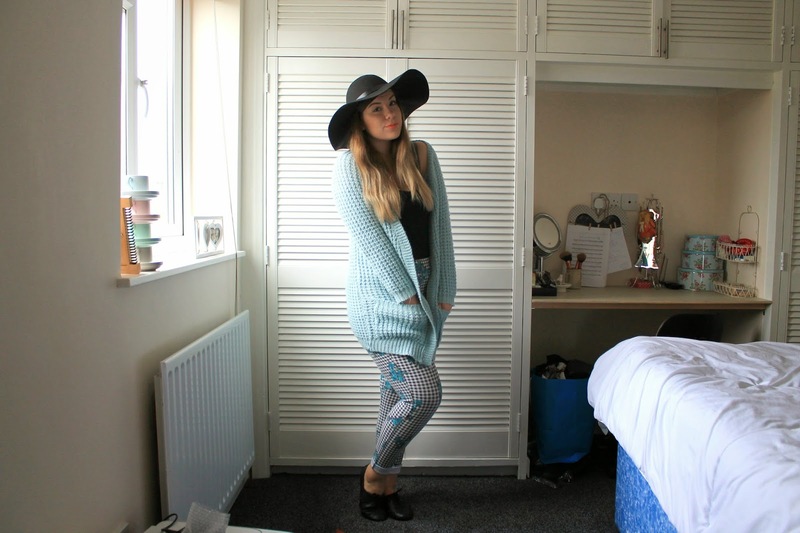 Now patterned bottoms of any kind are always my cup of tea, so when I saw these I couldn't resist! I adore gingham print as much as the next person, but me being me, I had to get the florals in there somehow. I think that they really help to add a subtle femininity to an otherwise pretty androgynous print. I especially like the hints of orange in the intricate flower detailing. This gave me the perfect excuse to wear my favourite orange lipstick from Topshop. 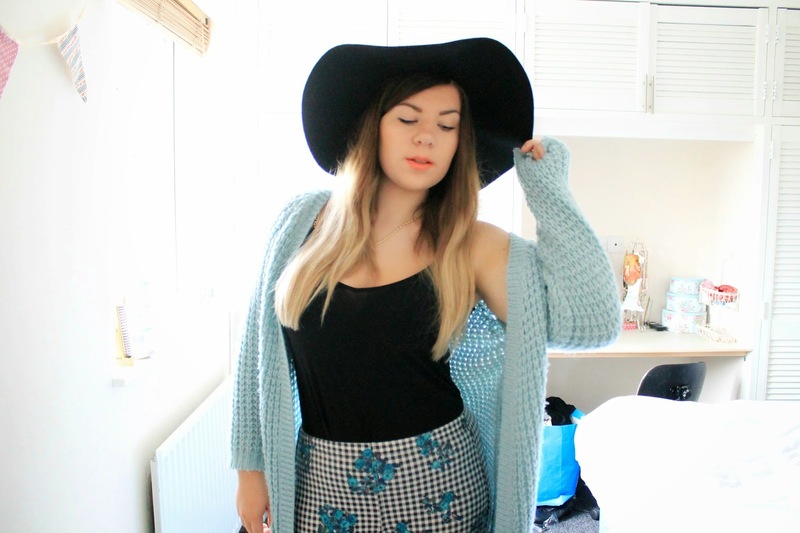 I then just threw on this super cosy knit from Primark. I love the length of this and the large pockets at the front are great for shoving your hands in if they're getting a bit nippy! I also thought that the colour was gorgeous & coordinated perfectly with the leggings. Now we move on to the hat. I mean, it's just fabulous. I've always been a hat person but just seem to have hoarded them rather than actually wear them. Generally I don't tend to wander into H&M as I never manage to find anything I like. However H&M are currently running 20% off discount for students right now so I thought I'd have a gander. I feel that the hat really brings something special to the look. It's so chic and classy, I honestly feel so much more confident wearing it! I've had so many comments on it, including one of my lectures remarking that he felt I should be singing 'Don't rain on my parade'. It really is a statement piece & a definite must for all you fellow hat hoarders out there. A word of a caution though - Don't' wear it when it's really windy or it will fly off your head. I have already found this out the hard way. Are you a hat hoarder? Let me know in the comments! PS: Can we just appreciate my snazzy new signature. PPS: If anybody knows how to stop my camera over exposing all my photos then please do tell!